Thank you to all the people who joined us on October 25, 2014 at the Hall of Flowers (San Francisco County Fair Building) in Golden Gate Park for our annual celebration The Festival of Rock Posters with some of the most talented artists around the country, and across the pond! This year was our best yet, with a record number of visitors thanks to your participation! Thank you for coming out and supporting the arts. We hope you enjoy these pictures taken at the event by Loretta Baraona. If you have any feedback or comments about this year’s event, please send them to us using our contact page. Thank you! 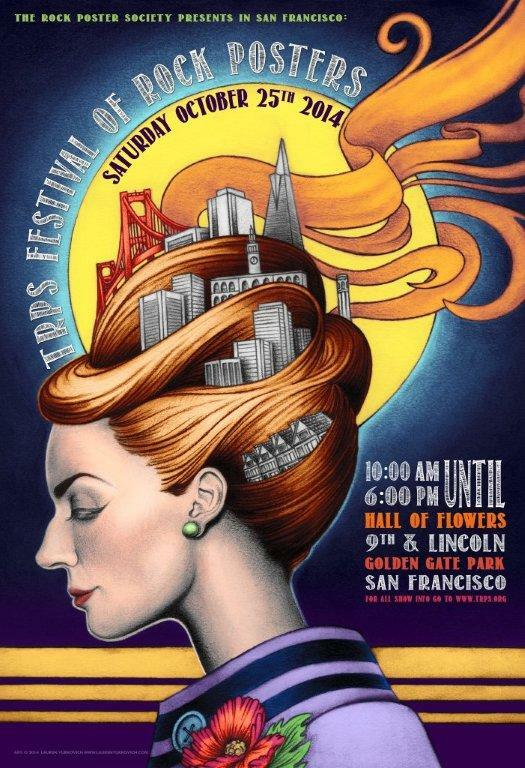 Our annual Fall Classic TRPS Festival of Rock Posters is confirmed for Saturday October 25th, 2014 at the San Francisco County Fair Building (aka Hall of Flowers) in beautiful Golden Gate Park. We’re thrilled to announce that Bonnie MacLean Graham will be joining us for her first San Francisco appearance at a TRPS event. The Bill Graham Foundation will be there as well, so this year’s show will be an informal celebration and remembrance of Bill Graham. We’re also stoked about first-time appearances of AJ Masthay and Adam Pobiak, as well as the return of so many of our favorites. Join the discussion on expressobeans.com. Add the event to your calendar on Facebook.